In DSP projects, it is required to read image files and load them into VHDL implementations of the image processing algorithms for functional simulations. In addition, there are many cases that images are loaded into FPGAs during synthesis for onboard verifications. This VHDL tutorial is to tell you how to read images in VHDL in a way that the images can be loaded into the block memory of the FPGA during synthesis or simulation. Since VHDL cannot read image files such as BMP, JPG, TIF, etc. directly, images are required to be converted into binary text files so that VHDL can read them using the TEXTIO VHDL package. To convert images into binary text files, you can use Matlab or C. Once the image binary text files are ready, you can copy it to the project folder. Now, let's do an example code for reading images in VHDL. For simplicity, let's assume that the following is the content of the binary text file that we converted from a gray image. Then, save the image binary file as "IMAGE_FILE.MIF" and put it to the project folder. Now, write a VHDL code to read this image binary text file and initialize it into a block memory during synthesis or simulation. 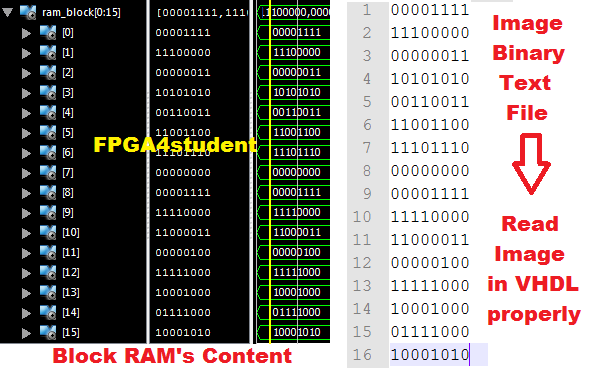 Below is the VHDL code for reading image files into FPGA. The code is synthesizable. Now, it's time to run the simulation and check if the image binary text file is loaded correctly into the block memory. 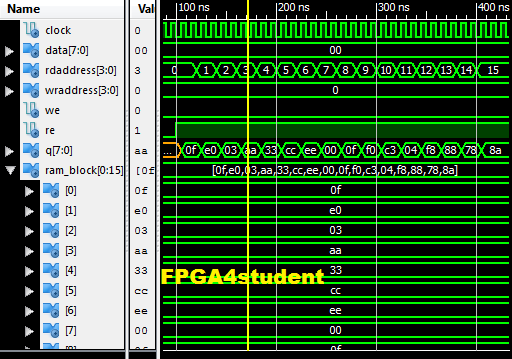 The following figure shows that the image was read properly into the block RAM of FPGAs. To read the image data in the block memory for testing your image processing design, just provide read addresses and enable memory reading. The following simulation waveform shows the image data in the binary text file is read out correctly at the output port of the block RAM. For reading images in Verilog, the tutorial can be found here. Could you share the warning? Did you convert the image into the text format above?